The digital image is typically made on a CCD (charged coupler device) sensor or a CMOS (complementary metal oxide semiconductor)sensor in a single shot. 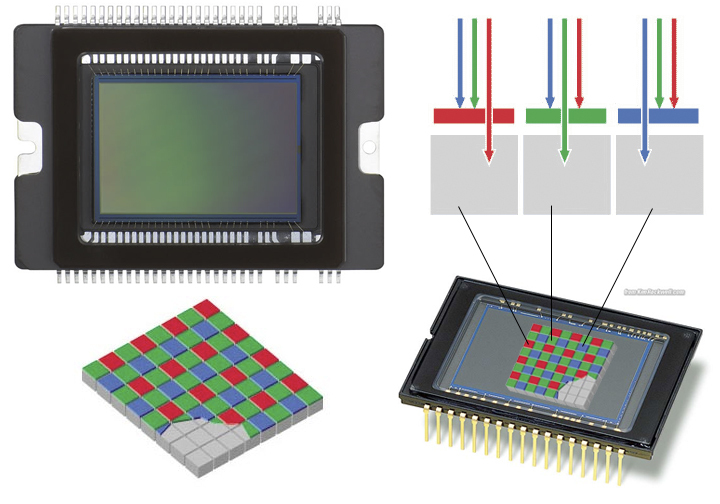 The sensors generate pixel color values by averaging one red, one blue, and two green pixel sensors in a 2 x 2 mosaic structure. Because of this structure, the capture data must be interpreted in order to produce a smooth result. With the red and blue sensor values, 75% of the color values for each of these sensors is guessed, while with the green sensor values, only 50% of the color value is guessed because there are two green pixel sensors. Once the raw image is processed, the underlying pattern is not seen. However, with subjects containing fine edge detail, moiré patterns or color fringing is possible. Multiple capture cameras are capable of recording sequential exposures of red, blue and green. As a result, each pixel is based on 100% color information and there is no pixel guesswork. In addition to the number of pixels the sensors are capable of capturing, the physical size, ranging from 14 x 21 mm to 24 x 36 mm will determine the magnification of the lens. If the sensor is smaller than 24 x 36 mm, the magnification factor will increase approximately 1.5x. Therefore, a 28 mm wide-angle lens that is used on an analog 35 mm camera will behave more like a 35 mm semi-wide angle lens. One of the most important components of a digital camera system is the number of megapixels or the number of pixels the sensor can capture. However, these numbers can be deceiving as not all of the pixels are used to capture the image, and the “effective number of pixels” that a camera uses is more accurate in determining pixel dimensions. Another consideration is the aspect ratio. The typical aspect ration for point and shoot cameras is 4:3, while the aspect ratio for typical digital slr’s is 3:2 which is identical to the ratio found with 35mm film. Memory cards is another important component of a digital camera system, and specifically, their read/write speed specifications and the speed in which digital images can be transferred from the camera to the computer. Memory cards typically come as 512 MB up to 64 GB and will determine the number of images and amount of video capture that can be made and stored while shooting. In utilizing RAW format and/or shooting video, it highly recommended to use a high-capacity memory card. So as to limit the possibilities of memory card failure, it is recommended to utilize no more than 90% of the capacity and always reformat the card in the camera before shooting a new batch of images. With most digital cameras, the digital images can be transferred directly from the camera to the computer with either USB or Firewire connectivity or with a memory card reader, which is recommended so as to not drain the camera battery. 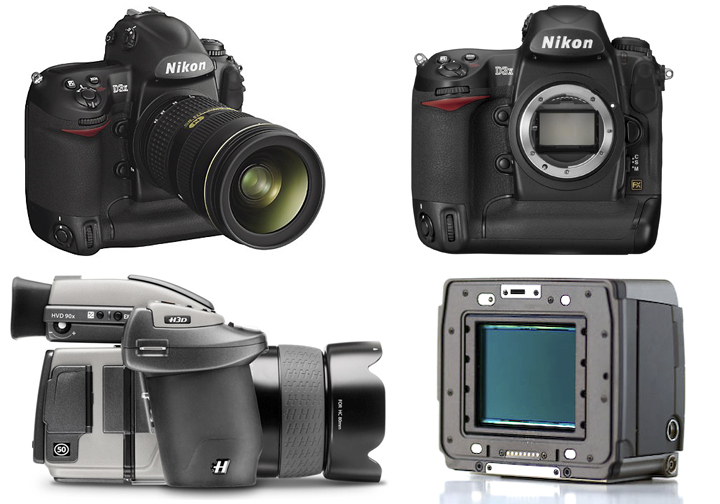 Nearly all digital single-lens reflex cameras and some prosumer digital cameras are capable of shooting in both RAW and JPG (with varying levels of image compression) file formats. Some cameras are also capable of shooting TIFF file format. In shooting in the RAW file format, the digital image file is essentially the data that the camera’s chip has recorded. It is comparable to the latent image contained in an exposed, but undeveloped, piece of film. The RAW file is considered the equivalent of a digital negative in consideration of the amount of visual information captured. Some of the drawbacks in shooting in RAW mode are longer in-camera write times to the memory card and larger files resulting in lower memory card capacity. In shooting in the JPEG (JPG) file format, the files are smaller and as a result more can fit on a memory card. For many circumstances, such as family images or news photos, the image quality is sufficient and in many cases can produce very high quality prints. Due to their small size, the JPG files are easily transmittable on the web. The JPEG file format can be set for varying degrees of image size and quality. TIFF is a file format for storing raster graphics images, popular among graphic artists, the publishing industry and photographers. A TIFF file format is widely supported by digital imaging applications, including image-editing, publishing and page layout applications. It is a particularly useful file format when scanning photographic film for use with digital imaging applications. 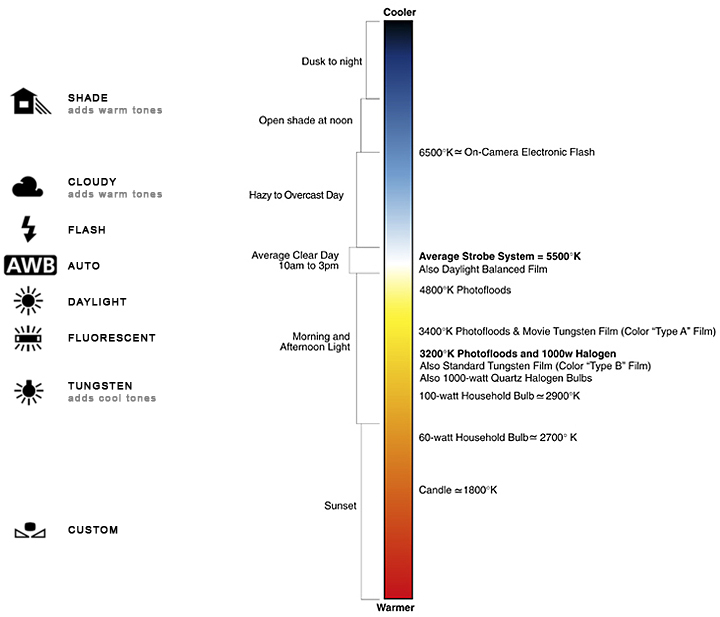 The color space is the environment in which the subjective nature of color is quantified, including the hue, saturation and brightness of color. 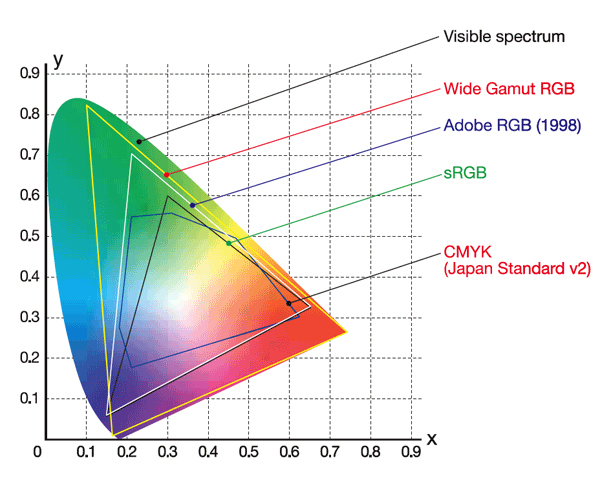 There are a number of common color spaces from which to work with in digital cameras, including sRGB, and Adobe RGB (1998). One of the important and distinguishing characteristics with each color space is the color gamut, which defines the entire range of possible colors possible in that system. RGB is the most dominant color space for digital artists and is the default space for most digital cameras and scanners. It is the preferred color space for digital inkjet printing. There are several sub-varieties of RGB working spaces, including Adobe RGB (1998) and sRGB. Adobe RGB (1998) is the largest of the default RGB color working spaces while sRGB is generally set-up as the default working space.